Who Says You Catch Only One Big Trout Per Trip? Changing weather conditions or changing water conditions directly impact the feeding habits of trophy trout. Change where and how you are fishing when conditions change, and you'll stand a much higher probability of catching more than one trophy fish in the same trip. Who Says You Catch Big Trout Only In Nice Warm Weather ? 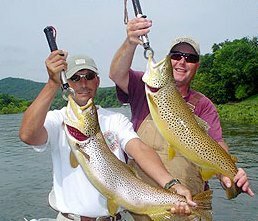 February and March offer the most exciting trophy trout fishing days of the year. 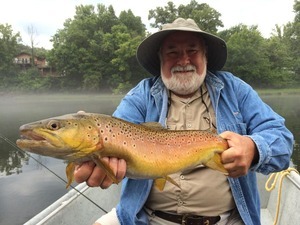 While Donald and the other guides at Cranor's Guide Service put their clients on big trout all year on the White river, the odds are higher in the late winter months. It's no secret that a snowy day in Feburary or early March is like having a lucky charm in your pocket. Cranor's Guide Service fishes all year because fishing is good anytime, and there are no closed fishing season. Who Says You Need Experience To Catch Trophy Trout? 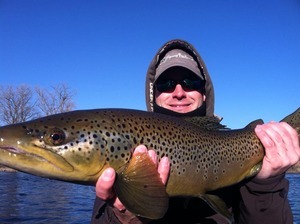 It's a common misconception that only highly skilled fishermen catch the big trout. All you need is a guide like the professionals at Cranor's Guide Service who can put you on the fish, then talk you through how to land the fish when you hook a beauty. Many people who have never been trout fishing in their life catch trophy trout on their first day out with Cranor's. 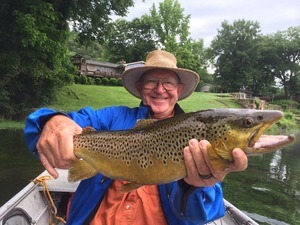 When it comes to experience, few have as much as Donald Cranor who started working as a trout fishing guide at the age of 15. That was in 1982...since then Donald has not stopped fishing professionally on the White and North Fork rivers.